Hello! It’s Courtney here. 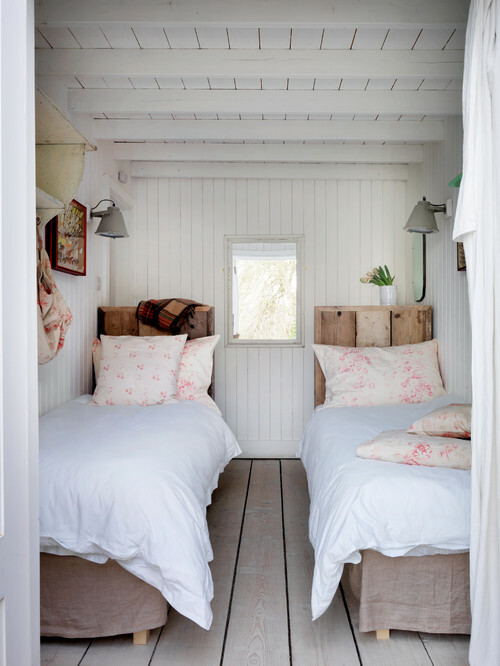 There’s something so sweet and charming about shared bedrooms, don’t you think? I’ve shared quite a few bedrooms in my life. When I was younger, I shared a bedroom for years with my sister and have great memories of chatting in the dark and laughing way past our bedtime. In college (Seattle Pacific University) I shared a dorm room with my first college roommate, then shared a ‘triple’ dorm room with two friends, then shared two more little bedrooms in rental houses with my best friend. I always loved the process of decorating each room with my roommates, considering both our individual areas and the room as a whole. These pretty shared spaces inspired me today…hope you enjoy! Hello everybody! I’m so glad you are here. I hope you are having a great Monday! I’m excited because I’m joining in Gina’s ! If you are just stopping by from , WELCOME! Even though we are still a few weeks away from the official start of summer, I’ve been starting the gradual evolution towards preparing my house for the warmer season. Now that might make it sound like I have had nothing more to do that just putter around all day getting the house all pretty for summer. IF ONLY! Ha! That would be my DREAM weekend right there. But alas, no. In my usual fashion of attempting to do ALL THE THINGS at the same time (why, ha! ), we are now preparing to move (if you missed the news, you can catch up .) SO, yeah, kinda doing a bit more than just puttering around making things pretty. But nesting is my hobby and my therapy so even when I’ve got lots to do to keep life rolling, I love slowing down to show some love to at least one corner of my house. It’s a good thing for me! In those especially crazy seasons, when I’m decluttering like a mad woman and my house is a complete mess, restoring order and prettiness to at least part of the house lets me feel more at peace so I can take a deep breath and keep on going. I’ll admit I am pretty sad about leaving my house (should we proceed to move as we think we will). We’ve worked so hard on making it feel like home and while I knew all along that this might not be our forever home, I grew to love it enough to be perfectly content to stay, should we decide that was the right thing to do. We’ve already lived here longer than in any other home, so I definitely feel settled and comfortable and in my dreams I’d be here forever. A new non-custom construction house was a blank slate for us, so we’ve really enjoyed seeing it transformed into a home. The journey to make this house our home wasn’t always easy though and many times I felt like we were going at a snail’s pace (and sometimes at a standstill! ), but when I look around at my house today after six years of TLC I know that each corner represents a part of our story, reflects a bit of ourselves and is prettier than when we started. Moving always feels like we are leaving a little bit of ourselves behind but I know I learned many lessons in this house that I will take with me wherever we go. I’ll be sharing more soon, but for now, let’s talk about SUMMER decorating! Pretend the sun is out, OK? This little green table was found at a local flea market awhile back and I knew right away I would find a place for it so it came home with me. I especially love the unique legs. As I was dusting the entry last week I had an idea, what if I took my Turkish towel from the wing back in the dining room and tried it on this table? I was so tickled when I thought of it (I always get pretty excited when I think of a new way to arrange or use things I already have) that I ran over and picked it up to try it immediately. Sure enough, I love it for a fresh summery look! I’m all about the little rope tassels and the green stripes, too. A few weeks ago I was in the mood to “shake up the house” a bit and moved the giant shell from the family room to the entry table. I had never tried the shell anywhere else (I’m not sure why!) but I loved it in the entry as a bold summer statement as you enter the front door. While the sun has been out periodically and it’s even been warm already this season, we aren’t really in full summer mode here until mid-July into early Fall. It still gets a little chilly on cloudy days. It was really dark out the other day and it looked like it might rain, so I was chuckling to myself as I was “summerizing” the house and taking pics while wearing a sweater. :) For cozier summer evenings I’m keeping one blanket over the sofa, just in case. I think it will come in handy. But in spite of the cloudiness outside, I was excited to bring a little sunshine inside with a couple of yellow pillows. I love yellow. I also was pretty thrilled because my peonies are blooming! Ever since we moved in, I dreamed of a little cutting garden in my backyard and I finally have one! I have roses, peonies, hydrangeas, daisies and more. I’ll be showing you more of my secret garden and other yard projects in the upcoming weeks (you can see a sneak peek of it outside my family room window in the next pic!). Now, speaking of shaking up the house, I did a little furniture rearranging. At Christmas time when we had family visiting, I moved these white painted rattan chairs from the kitchen into the family room to offer more seating during the holidays. I thought it might be a fun change even for the summer since the chairs are so light and airy, so I brought them back in and put the trellis wingback in the kitchen (sorry, I forgot to take a pic of it in the kitchen in time for this tour, but I think it looks cute there!). I love for sitting and for end tables, they are so versatile! My leather loveseat is from , I’m so pleased with it. You can see why I chose leather here. I adore the little frameable inspirational art quotes created for my book, Love the Home You Have. You can download this free print and many others on the book page. I like having inspirational quotes around to inspire me to keep on creating a home I love. I added some colored books to the antique bowl I found at a secondhand store a few weeks ago. I cleaned off my windowsills and added different containers with planted herbs and cut flowers. You can see my kitchen remodel (with more photos!) and my kitchen source list for more details on the kitchen. This is my third year growing Wisteria outside my kitchen window as a privacy screen and it has grown so much, I LOVE IT! For the first time it is actually blooming. The scent is glorious wafting through my sliding door. We’ve been working a bit outside trying to finish up some of our projects, but we still have a ways to go before I feel like it’s done. I recently showed you one of my backyard corner makeovers. Our yard started out as a typical barren “new construction” backyard but we’ve come so far in the past couple of years. This little spot looks really cute now, you can see the before and after in this post! While I love decorating inside the house all year round, in the summer I’m mostly working outside, soaking in every bit of sunshine I can out in the yard. I’ll be showing you the progress on my little secret garden soon! Before you go, be sure to follow me on because I’ll have a book giveaway there sometime today! Have you had a chance to read my book, Love the Home You Have? I have , due out November 1st that I’m super excited about! But this pretty little book is near and dear to my heart. It’s all about finding (and remembering!) the love for the home you have. Whether it’s a temporary abode or your forever home, sometimes we just need a little inspiration to embrace what we have right in front of us. Big or small, our home is a gift we can open as long as we live there! This book offers encouragement and practical tips to create a home and life you’ll love. Thank you so much for all the love many of you have shown for this book already! I’m so grateful to have such great friends out there. Want to create a home you can’t wait to come home to? I can help! Check out all of my decorating, organizing, and homemaking books right here! I’ll be back with more summer decorating and projects, and of course, updates on what’s next for our family! See more of my home on my House Tour page and the whole tour will be in my upcoming coffee table book, Onerror!